The conference was organised by IMS Global Learning Consortium and Digitalme in partnership with Open University and JISC. I was glad to support the event and the preparation of the summit program. We have had a great line up of speakers starting with Matthew Taylor (Chief Executive of the Royal Society for the encouragement of Arts, Manufactures and Commerce, RSA) who wrote about digital badges in his report commissioned by the UK Prime Minister, titled “Modern Working Practices” (Download here). Mark Leuba, IMS Vice President, set out a global vision for an Open Badges Ecosystem, exploring how Open Badges v2.0 can empower us to communicate our verified knowledge, skills, and achievements to employers, educators, and our peers and how new features allow institutions to scale their programs and deliver on the promise of digital credentials. David Leaser, Senior Program Executive, IBM Support Transformation, Skills and Globalization presented the employer’s view on Open Badges and the impressive developments in the IBM Open Badge Program. Chris Jones, CEO of City & Guilds together with Jonathan Finkelstein, founder & CEO of Credly talked about the evolution of recognition of skills. Patrina Law from Open University UK (see badged courses at OpenLearn) talked about employability skills for Higher Education and how digital credentials can support learners transition from HE to employment. To find out more about the Open Badge Summit, follow the Twitter stream using the hashtag #ModernEmployment. This March I had an opportunity to visit the Staff Training and Research Institute of Distance Education (STRIDE) at the Indira Gandhi National Open University (IGNOU) in New Delhi, India. I was invited to give a workshop on Open Badges as part of the STRIDE activities at IGNOU. IGNOU is one of the largest universities in the world and is also known as “The People’s University”. STRIDE was set up in 1993 as a training and research institute for distance education in the South Asian Region. STRIDE has developed a number of training materials related to Open and Distance Education und runs the Indian Journal of Open Learning (IJOL) published by Indira Gandhi National Open University. It was very interesting for me to learn about Open Education and Open Badges activities at IGNOU and I was delighted to share the experience on Open Badges from Europe including Germany. Here is a short press release from the Times of India (21st March 2017) about the workshop on Open Badges at IGNOU titled “IGNOU Creates Awareness On Digital Certificates”. I am very grateful for this experience and thankful to the STRIDE team, especially Prof. Prabir K. Biswas (Director), Dr. G. Mythili (Deputy Director) and Prof. PR Ramanujam (former Pro-Vice-Chancellor of IGNOU) for a truly warm welcome, superb organisation and open sharing of ideas around Open Education. The Open Education Global Conference 2017 took place 8-10 March in Cape Town, South Africa. I was a great conference with a great number of interesting contributions and superb researchers and practitioners so I was very pleased to attend and introduce Open Badges as elements of Open Education in form of an Action Lab (see program and the Twitter hashtag #oeglobal). Also I presented a poster with the results of the policy research we have done in the Open Badge Network project. It seems to me that the discussion around Open Education has been often narrowed down to Open Educational Resources and recently MOOCs, not sufficiently taking into consideration other forms of Open Education and Open Learning. I see Open Badges as one of these elements of Open Education which should be anchored in the global discourse on Open Education and Open Education Practices. I hope through these contributions to the conference program, I managed to trigger the interest and discussion about Open Badges for Open Education in this global community. The OE Global Conference 2017 concluded but the Year of Open continues! The Year of Open is “a global focus on open processes, systems, and tools, created through collaborative approaches, that enhance our education, businesses, governments, and organizations” (learn more). “This Action Lab aims at exploring and designing Open Badges as elements of Open Education. Open Badges are based on an open standard which enables to anyone to recognise and openly communicate open learning achievements including skills. Open Badges are used as open (micro) credentials and are an important element of Open Education as they enable learners to get their open learning achievements recognised, digitally recorded, validated and communicated to any audience in an open and transparent way. Open Education has been discussed in view of open access and participation in open courses and the production and use of Open Educational Resources. However, the element of recognition and communication of open education achievements has been neglected so far. The European Open Badge Network project is one of the global initiatives to promote Open Badges: http://openbadgenetwork.com. We have just published the first discussion paper on policy recommendations for establishing Open Badges in Europe as part of the Erasmus+ strategic partnership “Open Badge Network”: http://www.openbadgenetwork.com, which brings together organisations from across Europe to support the development of an Open Badge ecosystem, promoting the use of Open Badges to recognise non-formal and informal learning. The policy discussion paper is a contribution of the Open Badge Network to the ongoing debate on potentials and challenges of Open Badges, especially in their use as digital credentials. The paper provides policy-makers with an overview of the basic principles, concepts and applications of Open Badges as instruments of digital credentialing, with the results of the first targeted analysis of potentials and challenges of using Open Badges as digital credentials from the perspective of policy-makers in different European countries and formulates some first actionable recommendations for developing, implementing and evaluating digital credentialing policies, strategies and action plans. Results of the PIAAC Consultations (PIAAC = Programme for the International Assessment of Adult Competencies). We have opened a forum on the Open Badge Network portal and invite comments and feedback on the policy paper. For our project it is a preliminary policy document in the charting out the main directions for the follow-up White Paper on Open Badges Policies. So the feedback from the Community is very valuable to us! We are looking forward to discussions about possible directions for establishing Open Badges as policy levels in Europe and beyond! Experiment “Open Badges” – potentials and challenges of digital verification of competences in higher education. Based on the concept of “experiment with a society as a lab” from the field of media sociology, the starting point for my keynote was the thesis that Open Badges like many other novel, digital technologies, are applied directly in educational contexts without prior examination of their potentials and risks. Most of the times digital learning technologies and concepts, such as Open Badges, cannot be validated in controlled settings of a research lab, but are first applied in real-life educational settings and validated only later through experimentation which takes place in a regular course of affairs, within existing organisational structures and processes and involving students, teachers and other subjects. Also, following the idea of mode 2 of knowledge production by Gibbons et al. (1994), the knowledge about the potentials and risks of novel technologies emerges as a result of an interdisciplinary, connected, open and cross-context interactions of persons involved in such experiments. This is also the case with Open Badges and the knowledge about the possibilities as well as effects of their application being created not only within one (educational) organisation but across diverse and globally distributed communities. While applying novel technologies and concepts, such as Open Badges, it is important to keep in mind that the effects of experimentation are not always predictable and may have both positive and/or negative effects on the subjects involved. Reflecting the knowledge created following the principles of mode 2 by Gibbons at al. (1994) and taking responsibility for the design and implementation of Open Badges and other novel technologies in (higher) education is connected to a number of ethical and legal questions, some of which have been addressed by Willis, Quick & Hickey (2015). Open Badges – the missing link? My keynote at the #RIDE2016 research conference – Research and Innovation in Distance Education and E-Learning, at the Centre for Distance Education, which took place on Friday 11 March 2016 at Senate House, University of London, focused on Open Badges as the missing link in Open Education. My aim was to view Mozilla Open Badges in a wider context of Open Education and this again in a yet wider context of the Open Movement, which started with the Open Source concept towards the end of the 1990ies. The open source movement is directly linked to Mozilla, created as a free-software community by members of Netscape, who publicly released the source code of the Netscape Communicator in 1998. Open Badges are one of the key initiatives and concepts of the Open Movement and of Open Education given their dedication and mission to explore new ways of open credentialing and accreditation for all types of learning (Knight & Casilli, 2012). It seems to me that the current version of open credentialing as enabled by Mozilla Open Badges, is at an intermediate stage, somewhere “in-between”, in a longer evolutionary process of credentialing practices. With a growing number of new ideas about technological enhancements of Open Badges and applications of Open Badges disrupting traditional credentialing, it will be interesting to observe what the next incarnations of Open Credentialing may look like and what the drivers will be. Will it be the big data research and the need to provide meaningful metrics to different stakeholders including learners, educational organisations, employers and educational policy makers? Will it be the critical pedagogy endorsing human ability to think critically about own education? Or will it be the employability approach reflecting the need for new career concepts? Given the different possible influences, it is important to discuss the underlying framework of values which can/should drive the future open credentialing practices. ➤ Carla Casilli & Daniel Hickey (2016) Transcending conventional credentialing and assessment paradigms with information-rich digital badges, The Information Society, 32:2, 117-129. ➤ Broekman, P., Hall, G., Byfield, T., Hides S. & Worthington, S. (2014). Open Education. A Study in Disruption. Rowman & Littlefield International, Series: Disruptions. 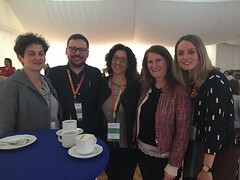 Open Badge Network (OBN) held its second multiplier event on 2nd December at Online Educa Berlin 2015 (OEB2015). Online Educa Berlin is the global, cross-sector conference on technology supported learning and training. In December 2015, over 2,000 participants travelled from more than 90 countries for three days of discussions, debates, labs, demos and special events, to network with international experts and to meet with suppliers and service providers from all over the world in the OEB exhibition. The OBN multiplier event was a full day pre-conference workshop (see: session FD4) dedicated to Open Badges for Individuals and Organisations. The workshop was organised by Ilona Buchem (Beuth University of Applied Sciences Berlin) and Michal Nowakowski (Institute of Sustainible Technologies – National Research Institute, Poland). You will find the full blogpost at the website of Open Badge Network.